Hispanics in the U.S. are divided on how to deal with the thousands of Central American children illegally arriving in the country, according to a Pew Research survey conducted earlier this month. About as many Hispanics support the current system for deciding immigration cases as do those expediting the process (49% – 47%), which would have the effect of speeding up deportations. The split among Hispanics is in contrast to views of the overall public, which backs a faster process over the current policy by 53% to 39%. Under current practice, it can take months or even years before the children are processed through the U.S. immigration system and either given asylum (or other legal status) or ordered deported. President Obama has asked for $3.7 billion in emergency funds, in part to help shorten the legal process by providing more judges. Meanwhile, the Senate and House are considering legislation of their own to deal with the issue. A record number of unaccompanied children have been arrested at the U.S.-Mexico border within the past fiscal year. Between Oct. 1, 2013, and June 30 of this year, 57,525 unaccompanied children under 18 (those traveling without a parent or guardian), were taken into custody, according to U.S. Customs and Border Protection. In June alone, about 10,508 were apprehended by Border Patrol compared with the 27,884 children who were apprehended during all of last fiscal year. The new survey also shows that Hispanics are more likely than U.S. adults overall to have heard about the influx of children from Central America. Some 94% of Hispanics said they had heard “a lot” or “a little” about the issue, compared with 89% of U.S. adults. Obama and some members of Congress have said the “humanitarian crisis” is yet another reason to pass a broad immigration bill – action that has been stalled by partisan disagreements since the Senate passed a bill one year ago but the House did not take up the measure. Hispanics are more likely than the general public to say it’s important for Congress to act on immigration. Three-quarters (75%) of Hispanics say it’s “extremely” or “very important” to pass significant new immigration legislation this year, compared with 61% of the general U.S. public (respondents were not asked whether they favored expanding or restricting legal immigration). Hispanics also put more faith in the Democrats than the Republicans on the immigration issue, with 54% saying the Democrats would do a better job compared with 40% of the overall public. While about two-thirds (68%) of the overall public support allowing undocumented immigrants to stay in the country if they meet certain requirements, a significantly larger share (85%) of Hispanics holds that view. 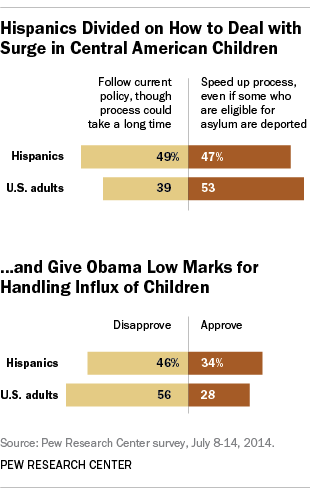 Indeed, Hispanics put a premium on changes in deportation policy. By a 55% to 35% margin, Hispanics said it is more important for undocumented immigrants to get relief from deportation than it is to have a pathway to citizenship, according to a 2013 survey of Hispanic adults by the Pew Research Center’s Hispanic Trends Project.